One of the greatest dangers to babies and young children is choking. Kids are naturally curious and tend to put everything they touch into their mouths. Many children under the age of five die each year due to choking and of those, two-thirds have not yet celebrated their first birthdays. Since children are not capable of deciding what is and is not safe, it is up to the adults in their lives to be sure that they don't have access to things that pose choking risks. Always supervise babies and young children at mealtimes. Cut food into very small pieces - about pea-sized. Never load the baby's feeding tray since babies are inclined to stuff their mouths rather than eating the pieces one by one. Do not allow your baby to eat while riding in a car since it will be difficult to provide adequate supervision and assistance. Establish a routine of eating seated at the table. Never let young children run, play, or lay down while eating. When feeding your baby any of the items listed above, be sure that you take the time to shred or chop them finely. 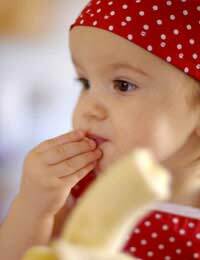 Babies have a tendency to swallow foods without chewing thoroughly (if at all), so their foods must be very small as not to block their airway. Although most parents and caregivers know to exercise caution at mealtimes, babies and young children are always on the lookout for new and interesting things to see. Items left on low tabletops are well within the reach of crawlers and young walkers, so be sure that you are alert to things that your child could choke on. Coins, buttons, paperclips, marbles, pen caps, and small batteries are all items that are dangerous to young children. Try to establish a place on a countertop or other out-of-reach location where you routinely empty your pockets at the end of the day. When purchasing toys, take the manufacturer's age recommendations seriously. Although your child may be intellectually able to understand and play with a toy labelled for older children, the age suggestions are designed to keep children safe. Often, toys are labelled for children over three years of age because they contain small parts, not because of the complexity of the toy. Latex balloons pose a risk since when they break, they tend to end up in several small pieces, and the bits can adhere to the internal part of the oesophagus and be hard to remove. Many stores that sell toys and baby supplies offer a plastic tube that will help you to determine if an item poses a choking risk to babies and young children. If an item fits into the tube, it is not safe. One of the best ways to be sure that your home is free of choking hazards within your child's reach is to see things from their vantage point. Get down on hands and knees to explore the rooms of your house, looking for small items that may be dangerous. Despite your best efforts, you may someday find yourself in the position of needing to offer life saving assistance to a child in your care. It is important for all parents and caregivers to learn infant CPR and proper protocol in emergency situations. Check with your family doctor for advice on taking a class to help you prepare for such an event. It is knowledge that you need to have, even though you hope you'll never have occasion to use it.